abstract In this paper we introduce a discrete shell model describing the behavior of thin flexible structures, such as hats, leaves, and aluminum cans, which are characterized by a curved undeformed configuration. Previously such models required complex continuum mechanics formulations and correspondingly complex algorithms. We show that a simple shell model can be derived geometrically for triangle meshes and implemented quickly by modifying a standard cloth simulator. 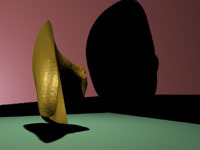 Our technique convincingly simulates a variety of curved objects with materials ranging from paper to metal, as we demonstrate with several examples including a comparison of a real and simulated falling hat. dropped hat regular / slow-motion Many surface-like objects in the real world are not flat. For example, car bodies, spoons, paper cups, bent paper, and hats. The physical behavior of such objects is governed mainly by their bending, or flexural, energies. This energy reflects the fact that the objects are not flat when at rest. Current cloth simulators and thin plate simulators do not account for non-flat rest states. Our contribution is to extend such simulators with a more general flexural energy. v beam regular To emphasize the importance of flexural energy in the behavior of thin shells, observe these six thin v-beams under identical initial conditions with varying bending energy. 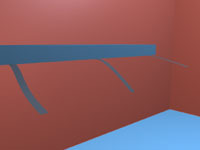 The highest bending coefficient, at far right, leads to the stiffest beam rigidity. 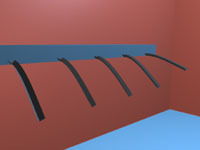 Most of the rigidity of these beams comes from their non-flat rest state. flat beam regular These flat beams require much higher bending stiffness coefficients to achieve the same flexural rigidity as the v-beam. The flat nature of these structures results in significantly different behavior. 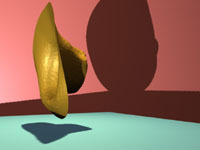 hat far regular / slow-motion Hats, due to their non-flat rest state and their flexibility, exhibit complex flexural phenomena. 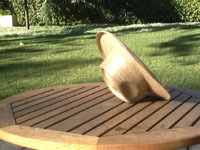 This hat stores energy as it lands on the table, and uses the stored energy to bounce off the table's surface. Some energy is also released as oscillations throughout the hat: depending on our chosen stiffness and damping coefficients, we are able to capture or filter away such high-frequency wobbles. hat close regular / slow-motion This is a closer view of the above simulation. 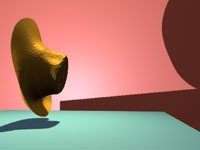 rigid hat regular / slow-motion By scaling the bending stiffness eightfold we can make the hat behave, somewhat unrealistically, like a rigid body. The simulation begins with the hat at a high initial velocity. floppy hat regular / slow-motion Decreasing the bending stiffness and maintaining bending damping, we simulate a softer hat. Note the increased energy dissipation during the initial impact and the subsequent stilted rebound. 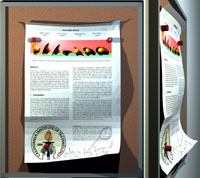 The simulation has a different camera position but identical initial conditions to the rigid hat above.